Public Works Department (PWD), Assam Recruitment 2018 August | Assistant Engineer/ Junior Engineer [463 Posts] :- Public Works Department. Govt. of Assam invites applications from Indian Citizens for the under-mentioned posts under Public Works Department, Government of Assam under Regulation 3(f) of the Assam Public Service Commission (Limitation of Functions) Regulations, 1951, in the Scale of Pay and Grade Pay as indicated below along with usual allowances as admissible under Rules of the Govt. of Assam. We have discussed in details about the vacancy in PWD Assam below. 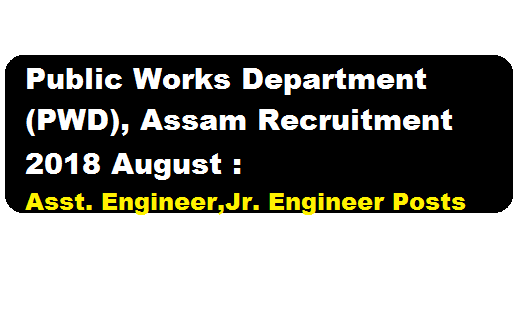 In this section, we will discuss in detail about Recruitment for the posts of Assistant and Junior Engineer under Public Works Department (PWD), Assam Recruitment 2018 August with all the details and requirement. Online form may be filled up with effect from 24.08.2018 to midnight of 07.09.2018 only. Candidates are required to apply in prescribed form through online mode only. No other mode for submission of application is allowed. Any change or amendment to this Advertisement will be posted on the above mentioned websites only. The appointment will be purely on ad-hoc basis for a period of 4 (four) months and to become eligible for regular appointment a candidate must qualify himself in the regular recruitment test as and when held.